Successfully Added Wireless Rearview Back-Up Camera Kit - Camera + Monitor to your Shopping Cart. Wireless Rearview Back-Up Camera Kit - Camera + Monitor. Wireless backup camera system with 2.5 inch LCD monitor. This easily installed rear view camera and monitor kit will ensure you can park and reverse safely. The camera is small and provides a crystal clear color video signal to the 2.5 inch TFT LCD monitor. 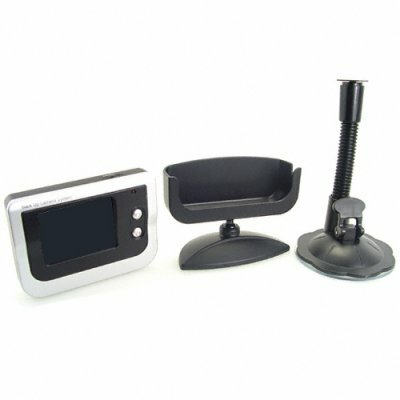 The small unobtrusive monitor has three different mounting options that enables it to be placed in the most ideal viewing angle for you car. Reversing and parking are made easy with a wide view angle (80 horz/60 vert degrees) camera that mounts on top of the license plate. An ideal add on for any car needing to park in congested cities or for anyone with a large vehicle. Another factory direct product proudly offered by Chinavasion Electronics exclusively to our wholesale customers. Wireless backup camera system with 2.5 inch LCD monitor. Reversing and parking made easy. Camera mounts on the license plate.